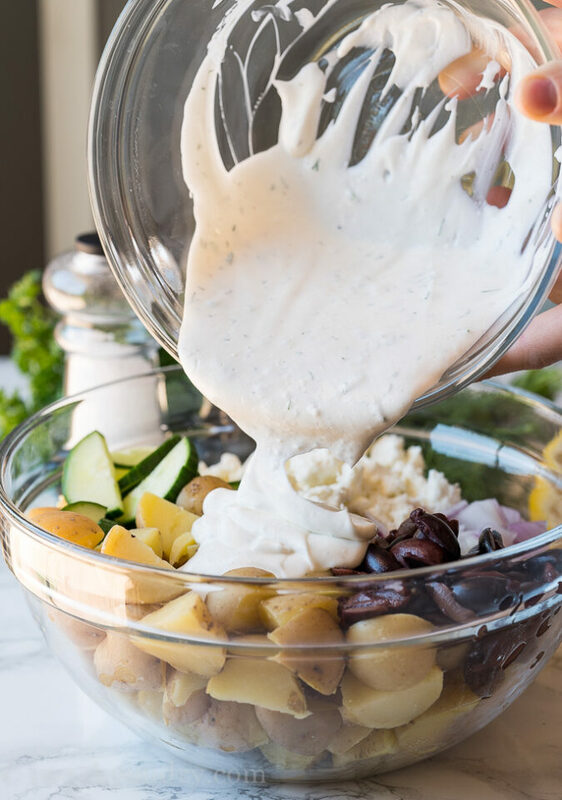 This creamy Greek Potato Salad is full of crunchy cucumbers, salty kalmata olives, red onion, and loads of feta cheese in a creamy greek yogurt dill sauce. 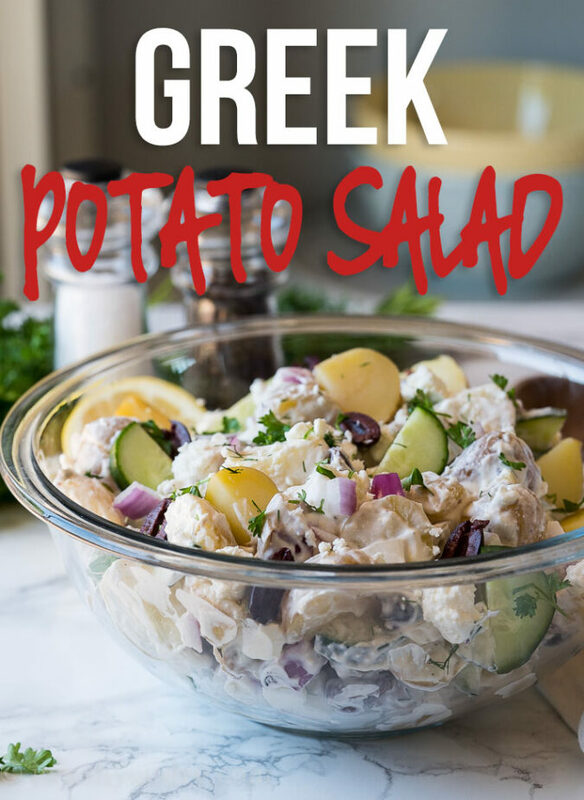 With summer temperatures rising, this cool and refreshing Greek twist on a classic potato salad is just what your next bbq or potluck needs! You’re going to love the flavors of that are jam packed into this super simple 30 minute side dish! I like to buy the baby gold potatoes for this salad because they’re quick to boil, and are more creamy on the inside than your classic baking potato. Make sure you dunk your hot potatoes into a bath of cold water to stop them from cooking any further. Once your potatoes are cooled, quarter them and toss together this super easy potato salad! 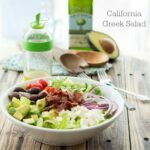 We love the bright fresh flavors of Greek food, so I knew that’s where I wanted it to start. 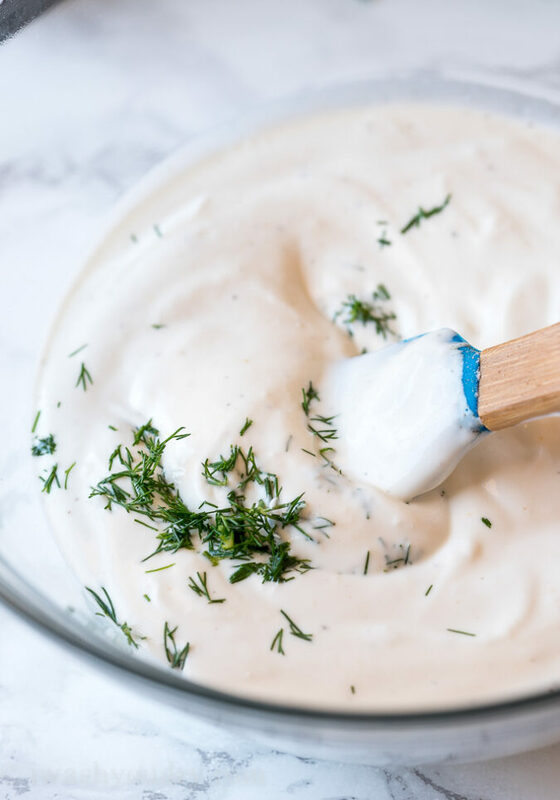 I made a creamy tzatziki-inspired sauce, which is basically dill infused greek yogurt that’s brightened up with a little lemon juice. Then I loaded the salad with diced red onion, sliced kalmata olives, sliced cucumbers to add a little extra crunch to contrast the tender potatoes. 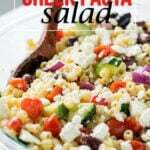 I also piled it hight with feta cheese, cause I seriously love that stuff. I would recommend using fresh dill in the dressing because it brings out the flavor so much more than the dried dill. But if that’s all you have on hand, then the dried dill will also work just fine. If you’re looking for a tasty twist to your Classic Potato Salad, then give this great side dish a try! I brought this to a family bbq and it was seriously the first thing to go and EVERYONE was raving about it! 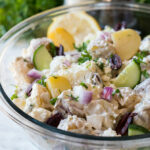 If you’re looking for something delicious to pair with this Greek Potato Salad, try this Last Minute Grilled Chicken! It makes for the perfect summer meal! 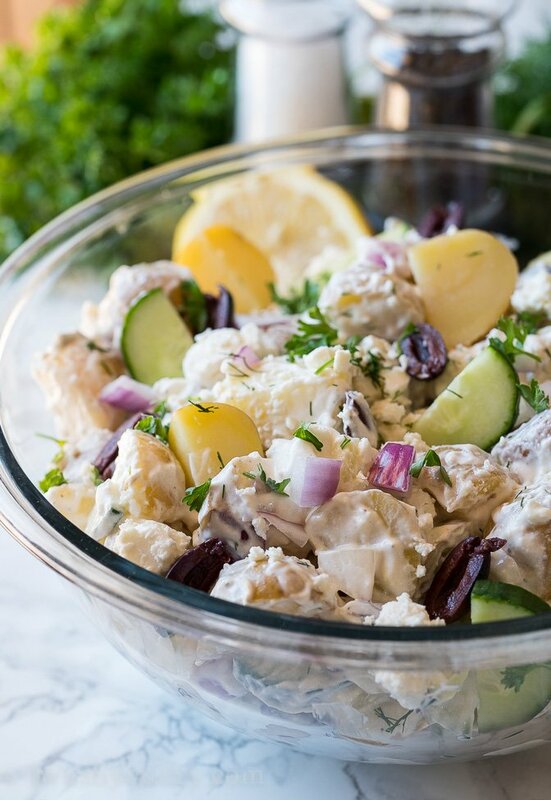 Greek Potato Salad is full of plump potatoes, cucumber, kalmata olives, red onion, and loads of feta cheese in creamy lemon dill sauce! Boil the potatoes in salted water for about 10 to 15 minutes or until easily pierced with a fork. Drain, then set strainer in a clean sink filled with ice cold water to cool the potatoes and stop them from cooking any further. Once cooled, drain and quarter potatoes and then add to a large bowl. 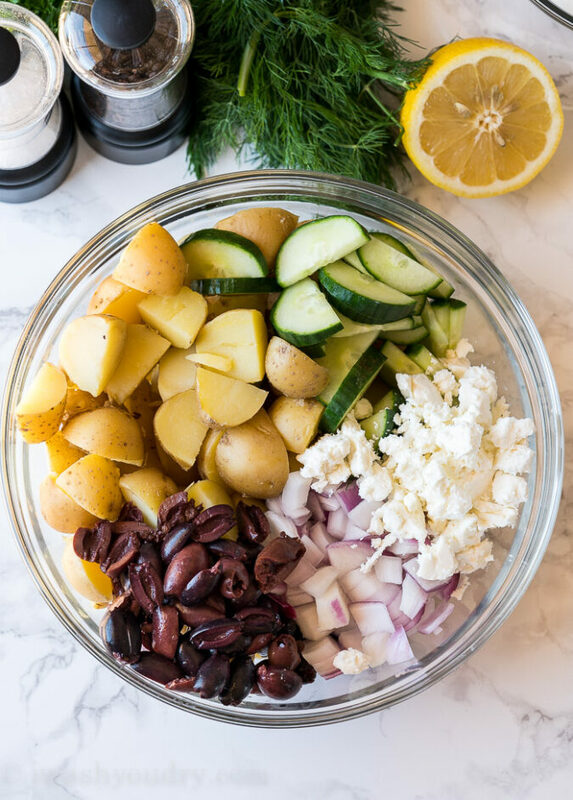 Add the cucumbers, onion, kalmata olives and feta to the bowl with the potatoes. Meanwhile, in a small bowl whisk together the greek yogurt, mayo, lemon juice, dill, garlic powder and salt and pepper to taste. Add the creamy sauce to the bowl with the potato mixture and gently toss to coat. Top with freshly chopped parsley and keep covered and chilled until ready to serve. Enjoy! 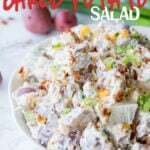 This potato salad can be made up to a day or two in advance. Just toss and make sure to stir the salad again before serving. Tried it and we couldn’t keep our forks away…we had to keep going back for more. So delicious thank you! You could definitely use sour cream instead of greek yogurt. It will change the flavor quite a bit though. Perfect ingredients, perfect result ! Thank you very much ! Love this Greek twist on potato salad! This is just in time for the plethora of cucumbers from the garden; I’m thinking replacing 1/2 the potatoes with cucumber chunks. We love tzatziki– never thought about using it for potato salad. Yummmm!! Can’t wait to give this a try! Pinned it!